As Buffalo Bill’s Performers, They Were Walking Stereotypes. But a New York Photographer Showed the Humans Beneath the Headdresses. In 1898, William F. “Buffalo Bill” Cody led a spectacular parade down Fifth Avenue in New York. A troupe of hundreds of performers—American Indians in traditional headdresses, cowboys in 10-gallon hats, and military men from Europe, the Middle East, and other countries who were known as the Congress of Rough Riders of the World in colorful regalia—marched down the broad avenue, accompanied by hundreds of horses, buffalo, and other animals. Cody and his partners marketed the Wild West program as an educational exhibition and experience, introducing audiences to the American frontier and cowboy life, American Indians, and later, internationally acclaimed military and equestrian teams. Ticketed patrons could visit the Wild West village, the camp where Cody and all of his performers lived at each tour stop. Cody befriended many of the American Indian men performing with his Buffalo Bill’s Wild West, but the daily programs depicted American Indians in the most stereotypical of situations, relentlessly attacking white American settlers or soldiers. New York City art photographer Gertrude Käsebier saw the grand parade down Fifth Avenue and wondered if she might be able to capture a more intimate side of the performers. She was interested in the American Indians as individuals, not on-stage caricatures. Käsebier had grown up on the Plains, and her family had raised her to respect Native American culture and traditions. She wanted to photograph them like she would any of her usual subjects, capturing within each portrait the individual character of the men. I first encountered Käsebier’s photographs while working in the photographic history collection at the Smithsonian’s National Museum of American History, which holds over 100 platinum photographs by Käsebier. I can tell you that her photographs are markedly different from those of other photographers of the era, especially Edward Curtis, who chose to photograph American Indians in dramatic Western settings, sometimes adding props or clothing he carried. Curtis’ body of work was intended to document the vanishing Indian. Kasebier’s portraits, by contrast, are rich images of men in transition, individuals determined to embrace 20th-century opportunities and experiences far from their Western homes. Many audiences were introduced for the first time to American Indians and their culture (albeit one filtered by white Americans’ sensibilities) through the Wild West performances. When the shows started, the U.S. government was still fighting what became known as the Indian Wars. In the decades following the Civil War, these conflicts that had started as a result of manifest destiny were exacerbated by United States push to reunify, and claim lands seen as rich in resources. Violent clashes resulted across the West from the late 1860s to early 1890s, with the eventual removal of hundreds of tribes from their native lands. The 1890 Battle of Wounded Knee officially ended those wars, but audiences to Buffalo Bill’s Wild West remained fascinated with the “enemy.” The American Indian performers at Buffalo Bill Cody’s show—and its imitators—created a “safe” context in which to explore the complicated relationships between the American Indian, the government, and the American public. Each year the show toured, several hundred American Indians welcomed the opportunity to play themselves, and the federal government’s agents on their reservations helped sign them up for Cody’s company. An Indian typically got paid $25 to $75 a month, with additional pay for extra tasks. Ironically, when traveling with the show, American Indians could wear traditional items and perform certain rituals that federal rules now forbade on reservations. But the Indians faced challenges on the show, including being far from home for the first time and encountering new types of illnesses—not to mention the strain of two three-hour performances, six days a week. And they had to contend with marketing images promoting them as uncivilized but noble savages, even as many of the younger Indian performers were educated and fluent in English. Käsebier wanted to capture this complexity. So she penned a request to Cody for a portrait sitting in her studio with the American Indian performers. On April 24, 1898, the last day of the three-week spring booking at Madison Square Garden, a dozen Sioux Indian performers arrived with their interpreter at Käsebier’s studio on Fifth Avenue. The men were from the Pine Ridge reservation in South Dakota. They prepared for their photographs by meeting the night before in the Wild West camp to share their finest clothing and accessories. Chief Iron Tail, who was about 47 at the time and an elder tribal battle hero, represented bravery and respect among the group selected to visit the photography studio. He joined the Wild West in 1889 before its second European tour, and he developed a strong friendship with Cody, with whom he often went on off-season hunting outings. He may have participated in the Battle of Little Bighorn in 1876, which was sometimes recreated during Wild West performances. Kasebier achieved exactly the kind of portrait she envisioned of Iron Tail: a relaxed and intimate portrait of a man, devoid of decoration or finery, without barriers, as she herself would explain it. Chief Iron Tail, meanwhile, hated his portrait. When shown the Käsebier image, probably by the photographer herself, Iron Tail promptly tore the photo up, saying it was too dark. 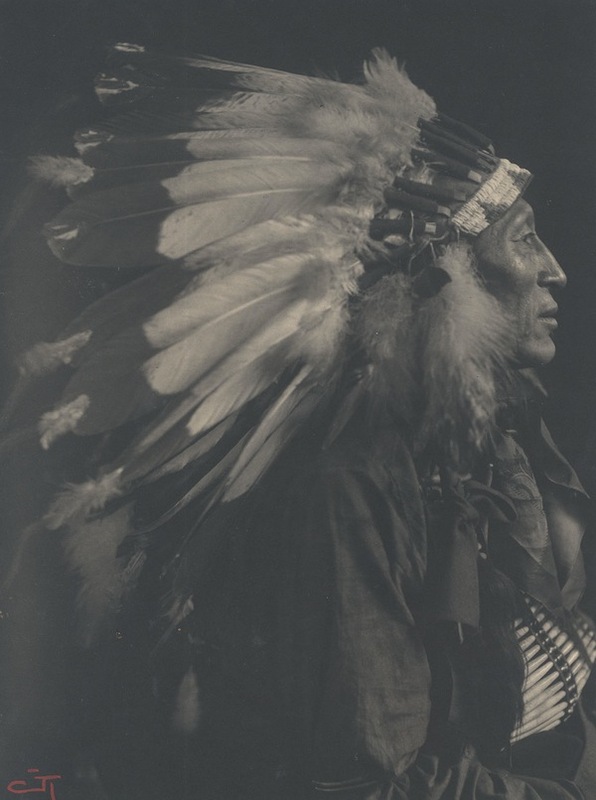 The usually reserved Sioux elder had strong convictions about his own image, and gained the satisfaction of one final bold profile portrait several days later wearing his full feather headdress. Each feather in his headdress, or war bonnet, represented an act of bravery over a lifetime, similar to the medals of a U.S. military soldier. He was more interested in presenting a vision of the warrior he once was—the warrior he portrayed in Buffalo Bill’s Wild West Show—than in embracing the vulnerable man in Käsebier’s first image. And so, Chief Iron Tail got the image he desired, and Käsebier held on to her original effort. But she rarely exhibited the portraits of these men or published them. It was a very personal project, only shared with family, her peers, and the “Show Indians” photographed in her studio. The full set of prints and original negatives remained with her family until 1969, when her granddaughter, Mina Turner, donated the platinum photographs to the Smithsonian and the original glass negatives to the Library of Congress. Both Cody’s spectacle and Käsebier’s more introspective portraits left a lasting legacy. Even though Cody’s show was controversial—some people complained about allowing the Indians to travel and perform, others about their poor treatment and wages—it seemed to fuel the efforts of the federal Bureau of Indian Affairs and reformers to pursue better treatment of all American Indians across the nation. Throughout the time Buffalo Bill’s Wild West was on Americans’ minds, groups battled in Congress over the rights of American Indians. Käsebier’s portraits provide a poignant counterpoint to the Wild West Show. The intense gazes and the slightly bemused lip curls she captured (improbably enough) in her New York studio say a great deal about the transition, and ultimate fate, of these individuals. They are neither vanquished nor triumphant, but merely survivors, determined that their stories continue on into the new century. is director of the Smithsonian Consortia for the American Experience and World Cultures. She is the author of Buffalo Bill’s Wild West Warriors: A Photographic History by Gertrude Käsebier. Photos by Gertrude Käsebier, courtesy of the Smithsonian’s National Museum of American History.